RecBoot Won’t Work, What to Do? Many people have been using RecBoot for a long time and it really helped them with iPhone stuck problems. However, some users have found that RecBoot not working in exiting recovery mode after installation recently. Others have also reported RecBoot doesn't recognize iPhone. It is pretty frustrating that RecBoot is not available as this great tool can put iPhone into or exit recovery mode easily. To help users fix iPhone stuck in recovery mode, we highly recommend Free iPhone Recovery Mode Software ReiBoot - the best free iPhone repairing software to get rid of any stuck issues within simple clicks. Free download this amazing tool and have a try. Recovery Mode will be able to reset your iPhone, iPad or iPod Touch to fix many iOS issues. That's why RecBoot was brought into stage. 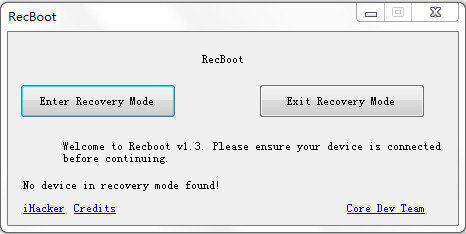 But sometimes RecBoot won't enter recovery mode, With Tenorshare ReiBoot, you won't have extra worries. Free Tenorshare ReiBoot is expert in fixing all kinds of iOS stuck issues including recovery mode, black screen of death, white apple logo etc. Moreover, it also works great in repairing iOS mode stuck and iTunes bugs without restoring or losing data. Follow the steps below to escape recovery mode quickly. Run Tenorshare ReiBoot and then connect iPhone to computer, your device will be detected automatically. Once your device is detected, click "Exit Recovery Mode" to fix your stuck iPhone. Note: If your device is still stuck in Recovery Mode, white screen, black screen and Apple logo loop, it could be a hardware problem. To fix this, you need to repair your operating system. Choose "Fix All iOS Stuck" in the main interface and then click "Fix Now" to go on. Press "Repair Now" and you'll see the download firmware package window, choose a save path and start to download firmware package. Click "Start Repair" to repair your stuck iPhone by repairing operating system. Next time RecBoot doesn't work, just use the effective alternative to get your iPhone out of recovery mode and repair your system.